Properties in Auronzo di Cadore average 4.5 out of 5 stars. 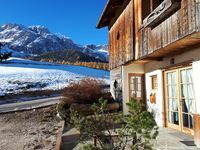 Property 20: Cortina, 10' walk to town, ski-in ski-out, unbelievable view, romantic attic with fireplace: really a nice place to live! Property 24: Crignes apartment a short walk from the center of Cortina, overlooking the Faloria. We loved this Villa. Incredible history (500 years!) w/ a modern remodel! Great small town. Perfect house. Pool for the kids. Large dining room and kitchen. Perfect spring break with skiing in Cortina and Fly Fishing on the Piave River.